In recent years, complaints that Congress is too careless in authorizing commemorative coin issues are frequently heard. 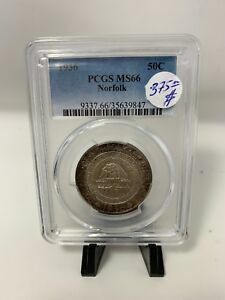 It's been said that too many events and causes of only limited national importance have been honored and funded through the sale of such coins. Obviously, Congress has a knack for repeating its mistakes, since the same complaints were voiced 60 years earlier and ultimately led to legislation that greatly restricted the approval of new coin issues. 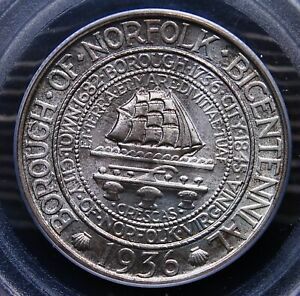 Among the coins that prompted this action during the 1930s was the half dollar honoring the bicentennial of Norfolk, Virginia's elevation to the status of borough in 1736. This commemorative marked an event of purely local interest, and its design bore no less than five different dates, none of which was the actual date of coinage! 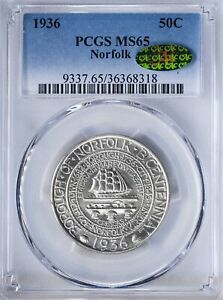 Much maligned at the time of issue, the Norfolk half dollar realized poor sales. In the irony that often attends such initial failure, it is now among the scarcer and more costly coins in the commemorative series. The city of Norfolk, Virginia is a major seaport located on the Elizabeth River. It is considered the site of the nation's largest naval base and has served in this role since the earliest days of United States history. In a reference not clearly defined, the date of the settlement's original land grant is given as 1636. More certain is that it was founded as a village in 1682, incorporated as a borough in 1736 and as a city in 1845. In the early days, its principal commercial activity was the shipping of locally grown peanuts and tobacco. As its shipbuilding industry grew, so did the strategic value of Norfolk as a military objective. At the onset of the Civil War, the federals were forced to flee Confederate guns in 1861, but they returned to retake the city a year later. This was not, however, until after the sunken federal ship U.S.S. Merrimac was refloated by the Confederates, plated over with iron and rechristened C.S.S. Virginia as the world's first ironclad warship. During World Wars I and II, Norfolk and its navy yard continued to expand in their military role, and this remains a major component of its economy to the present day. 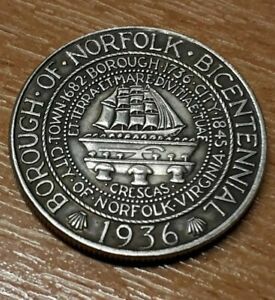 As the bicentennial of Norfolk borough approached, a civic group called the Norfolk Advertising Board sought a commemorative coin to mark the occasion and to fund local celebrations. Recognizing the limited appeal of such an issue, the Senate reworded this bill, substituting "medal" for "coin." In this form, the legislation was passed June 26, 1936. 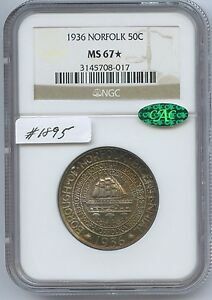 It was well known that medals sold poorly when measured against legal-tender coins, and the Board declined to proceed with the approved medal. Instead, it beseeched powerful Virginia Senator Carter Glass (whose portrait appears on the Lynchburg, Virginia half dollar) to make another attempt at a coin bill. This was slow in coming, but his influence finally pushed it through more than a year later on June 28, 1937. This bill authorized the coining of not more than 25,000 half dollars, to be coined at a single mint and with a single design. The fact that the bicentennial had come and gone no longer seemed relevant, as the movement to produce and sell coins had developed a life of its own. The models for this coin were prepared by William Marks Simpson (creator of the Antietam and Roanoke halves) and his wife and fellow sculptor, Marjorie Emory Simpson. 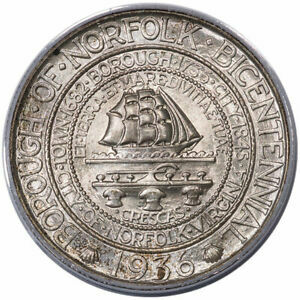 The extremely complex and crowded obverse depicts at its center the seal of the city of Norfolk, with a sailing ship placed atop a plow and three bundles of wheat. The various dates associated with the progress of this city are listed, along the anniversary date of 1936. The latter is flanked by scallop shells, and a circle of rope is likewise incorporated as a further reference to the city's seaport heritage. The reverse of the Norfolk half is dominated by the Royal Mace, which was presented to the city in 1753 as a token of esteem from Lieutenant Governor Dinwiddie. The balance of the design includes the date of the original land grant and the coin's value, as well as the various statutory legends and mottos found on all U. S. coins. The intertwined initials of the two designers appear in monogram form above the word DOLLAR. 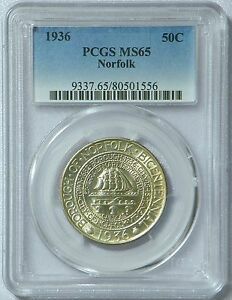 Although the Norfolk half has been described as overly complex and wordy, a view expressed by noted numismatic reviewer Cornelius Vermeule, it was seen in a more favorable light by the federal Commission of Fine Arts' sculptor member, Lee Lawrie. 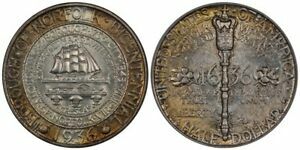 The models were submitted to the Commission on September 26, 1936, at which time the medal issue had been approved but the coins were still in limbo. In writing to William Marks Simpson, Commission Chairman Charles Moore related Mr. Lawrie's pleasure with the models, along with the latter's minor suggestions for improvement. These changes were subsequently made when the coin bill was approved the following June. Photographs of the revised models were forwarded to the Commission of Fine Arts on August 10, 1937, and approval was granted on the 14th. 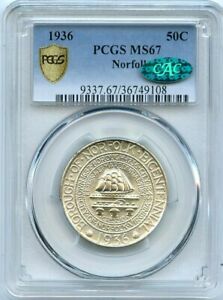 The entire mintage of 25,013 Norfolk halves was coined in September at the Philadelphia Mint (the odd 13 pieces were reserved for assay and later destroyed). 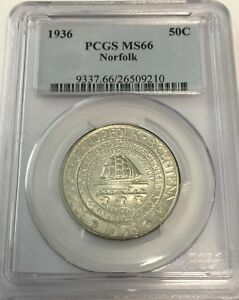 Orders had already been taken by the Norfolk Advertising Board at $1.65 apiece, with slight discounts for multi-coin purchases, and the first 15,000 sales were racked up fairly quickly. As the speculative mania of the previous year had long since subsided, however, additional sales were slow in coming. 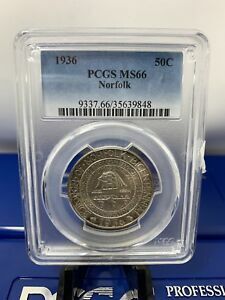 Despite strong promotion by Board Manager F. E. Turin and increasingly generous discounts for quantities of the Norfolk halves, by 1938 5,000 coins had to be returned to the mint for melting. Another 3,077 were destroyed sometime later, leaving a net mintage of 16,923 halves. Those that remained were primarily sold to dealers in quantity, probably at even greater discounts than advertised. Small hoards remained on the market for years. 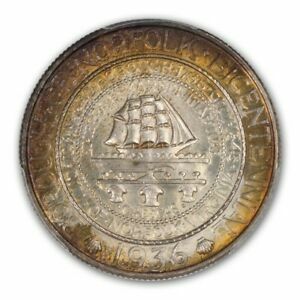 Since relatively few of these halves were sold outside of the numismatic community, most were well cared for and have survived in higher grades. Only a few may have suffered abuses such as harsh cleaning or abrasion. 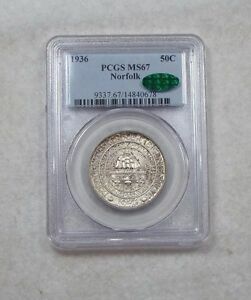 Further adding to the generally superior condition of Norfolk halves is the complexity of their obverse design, which tends to camouflage any contact marks. Their luster is of a satiny variety, ranging from dull to quite flashy. 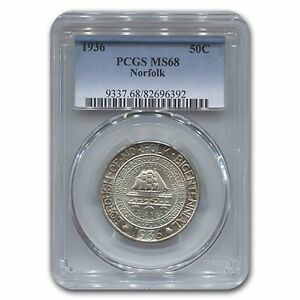 Pieces grading through MS-66 are often available, although higher grade examples are far fewer in number. Points to check for wear include the lower left of each sail and the highpoints of the mace. 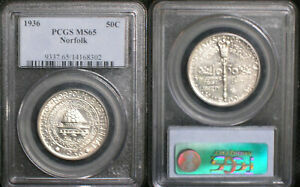 The Norfolk halves were issued by the Norfolk Advertising Board in conjunction with the Norfolk Association of Commerce. They were delivered in a cardboard holder containing holes for up to five coins. This was covered in a lime green paper mailer, inscribed with the name of the coin issue, the reason for commemoration, the sponsors and their affiliated associations. A poem by Charles Day appears on the back of the mailer. For reasons unknown, only William Marks Simpson is acknowledged as designer, his wife's name being omitted. 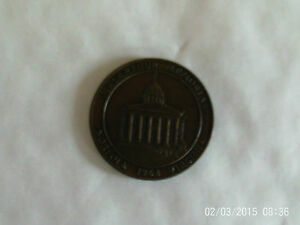 This packaging is a collectible in its own right and is highly sought by specialists in the commemorative series.